In a recent interview, writer Ian McEwan criticised the ever-ballooning length of the modern novel. "Very few really long novels earn their length," he stated. "My fingers are always twitching for a blue pencil." Certainly there seem to be more really long novels now than there were a generation ago (theories as to why this might be so are almost equally numerous). Personally, I have no preference either way. I can sympathise with what McEwan is saying about the immediacy of novels short enough to be devoured in a single sitting "like a three-hour movie or opera." On the other hand the novel I'd mark up as the greatest I've read in the past five years—Richard House's The Kills—clocks in at a thousand pages. Rules are there to be broken, then. But the writer who presents their readers with, in McEwan's words, "a real brick of an object" is making a bold claim not only for the importance and sustainability of their ideas—their message, if you like—but for the quality of their communication skills. Reading a thousand-page novel—or even a five-hundred-page novel—means a substantial investment in time and attention on the part of the reader. If there is any rule here that should be adhered to, it is that such generous investment should be met with adequate recompense. Michel Faber's latest novel The Book of Strange New Things is six hundred pages long. It tells the story of Peter Leigh, a non-denominational Christian minister who volunteers himself for a strange new mission: to be pastor to the native beings on the recently discovered planet of Oasis, his presence there having been requested by the aliens themselves. Peter is excited about the mission, about the new challenges it is bound to present to him and to his Christian faith. His one regret is that his wife, Beatrice, will not be going with him. The company in charge of the fledgling colony, an amorphous and somewhat mysterious organisation known as USIC, have deemed her unsuitable. Peter is transported to the alien planet via a kind of hyperjump—for him, it is as if he has arrived on Oasis instantaneously, whereas in fact a whole month has passed, a time period that comes increasingly to represent the unbridgeable and widening emotional gulf that begins to open between him and Bea, almost from the moment of Peter's departure. All very mysterious. All the more so when Peter discovers that there was another minister on Oasis before him, one Martin Kurtzberg (the horror, the horror) who is now missing. A second member of the USIC party, a linguist named Tartaglione and the only person who had a working understanding of the Oasian language, is also AWOL. No one is looking for them, however, and no one seems particularly interested in their fate. I'm pretty certain that if I were Peter, this matter would prey on my mind somewhat. But Peter seems content to let things ride. There are two ways of approaching this novel. The first is as a work of science fiction, together with the inevitable accompanying question as to whether Faber, as a writer largely defined by his considerable reputation within the literary mainstream, intended The Book of Strange New Things as science fiction or as some kind of literary metaphor. As science fiction readers, we will come at this text armed with a multitude of questions: how far into Earth's future are we, how was Oasis discovered, how does the hyperjump work (fuel is mentioned at one point, but what kind? ), what is USIC's true remit, what are the aliens really like and how aware of their situation are they, how come the planet's human colonists are unable to properly cultivate the native foodstuffs, why is no one answering any of these questions, and what the hell happened to Kurtzberg?? I do not enjoy being prescriptive about literature, but I'm going to venture the opinion that to be successful as a work of science fiction, The Book of Strange New Things would need to engage at some depth with at least some of these issues. And it really doesn't. Peter—incurious, endlessly self-contemplating Peter—acts as a barrier to our knowledge throughout. When some of the more pressing questions do eventually get answered, this appears to happen almost by chance, as opposed to through direct investigation or even the most basic internal act of giving a damn. As a work of science fiction, the best that can be said for The Book of Strange New Things is that, through a prolonged and increasingly eerie sense of disengagement and through sheer ungraspability, the peculiar blandness of what we are given to look upon, Faber does manage to evince a frisson of the truly alien (the interchangeability of the corridors inside the USIC building, the mulchy flatness of the ground, the uniform sameness of the Oasian dwellings, kept bringing to mind the tuneless, substanceless world on the other side of the time rip in Stephen King's long novella The Langoliers). The idea of Oasis being so fundamentally undramatic is immediately at odds with a majority of science fictional evocations of alien worlds, and this fact in itself is not without interest. But taken purely within a science fictional context, what The Book of Strange New Things demonstrates most efficiently is how difficult genuinely propulsive, intellectually stimulating, and imaginatively accomplished SFnal conceits and lines of enquiry are to achieve, and how easy it can be to fail at them. Contrary to belief in some quarters, failing at science fiction need not be categorised as a Class A literary offence. Examples of novels that are handwavy at best in this regard, and yet still succeed admirably as novels, as literary constructs, are too numerous to mention. As a recent example we might point to Emily St. John Mandel's Station Eleven, whose killer-flu-pandemic, depleted future trajectory is hardly revolutionary in science fictional terms, yet whose beautifully executed, detail- and character-rich backstory and tightly woven formal construction gave us a novel that stands a reasonable chance of becoming a modern classic. As a second way of approaching this novel, then, we might ask ourselves what Faber's novel offers in terms of characterisation, use of language, and formal construction, and whether any of these are enough in themselves to allow us to forget the book's shortcomings as a novel of SFnal ideas. For me, sadly, the answer is a dully delivered no. This is Michel Faber—he can write decent sentences, obviously, and there is nothing about the style one could point to as bad. But like those USIC corridors it is just . . . bland. Bland and endless. The narrative progresses in a straight line for six hundred pages at a kind of dull shamble—not a zombie-like shamble, sadly, because in this case zombies might have livened things up a bit. The pacing is almost unendurably slow—what might be described as narrative jolts come at the rate of about one every fifty pages (if we're being generous) and beyond Peter and Bea's Shoot messages there is zero attempt to alleviate the sheer, unmitigated, linear conventionality of form. If the novel were a fast-moving thriller this wouldn't matter in the slightest but The Girl with the Dragon Tattoo it is assuredly not. There is a lot of stuff like this, a lot of what might be called unthinking privilege. It makes uncomfortable reading, not in and of itself so much as in the fact that Peter's patronising attitudes are never interrogated by the text, and we are clearly meant to believe throughout that Peter is a good man. He is not a bad man, and he means well, but in terms of his characterisation it is impossible to reconcile the hard-living homeless man with the buttoned-up milksop fresh from the parsonage, spouting platitudes that feel insulting as well as naive. Indeed, Faber might have been better to eschew the reformed coke-fiend storyline entirely, as he seems so uncomfortable with it, and write Peter as the boy from the parsonage, having his assumptions and sheltered background thrown into question for the first time. This irruption of blunt reality, this sudden explosion of plain talking into the blandishments of what has come to be the status quo on Oasis, comes as a monumental relief, like spilling bright paint across a dull grey surface. I could so easily imagine a version of this book in which Tartaglione was the protagonist, with the novel relating the story of his enlightenment and fall. Yet we never see him again after this one encounter, and his provocations—the only grist to the mill Faber is prepared to offer us—are swept under the narrative carpet as the babblings of a drunkard. It should be noted that Peter's initial response to Bea's distress is to remark upon her typos and to wonder if she might have been drunk when she wrote to him (p. 414—I could sense her wanting to punch him from here). The people Bea talks about—the young girl who has committed suicide, the new minister who makes off with the church funds, the awful administrator at the hospital where she works, her friends in the parish—seem far more interesting and rich in actuality than nearly all of the characters in the main narrative, and I could never escape the sense that if only Bea had been released from the framework of this novel and allowed to tell her own story I would have enjoyed that book a whole lot more than the one I was reading! Instead, like Peter, Bea is forced into the mould Faber has prepared for her—she's there to trot out suitably extrapolated news stories des jours, and to expound the kind of Christianity that belongs more to idealistic six-formers than to any deeper examination of religious faith and the fundamental mystery of the relationship between the human mind and the human spirit. 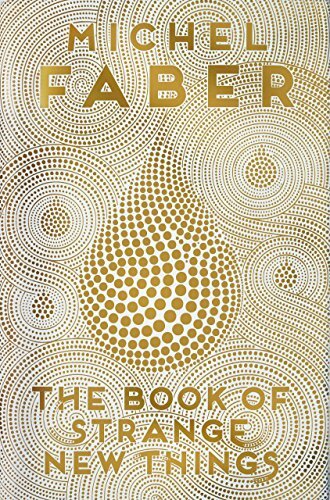 Faber's whole construct here feels wrong to me, someone's idea of what having a radical faith might be like, without ever approaching its true complexity or contradictions. I found this novel almost impossibly difficult to get to grips with, precisely because I found it hard to comprehend how a writer as accomplished as Faber could keep shooting so wide of his own target. There is only one interpretation that makes sense to me, and that is the autobiographical one. We know from what Faber has said in interviews that The Book of Strange New Things was written while his wife Eva was dying of cancer—indeed she died before the book was complete. If we consider this text not as an elaborate construct about Christian missionaries on alien planets, and look at it instead as an extended metaphor for a husband trying to deal with the approaching death of his wife, then it immediately acquires a greater strength and poignancy. Peter's mission to a distant planet is a cipher for the writer's ability to escape into writing, to bury himself on "Planet God," in his "book of strange new things." His escape to "Oasis" is a coping mechanism, which in its turn appears to his Beatrice as a denial, a refusal to face the terrible changes that are happening closer to home. Bea's fear and distress at the widening gap between them—the gulf that opens, more or less immediately, between a person who is experiencing terminal illness and one who is not—is self-explanatory. Such a reading of Faber's novel is persuasive, but is it even valid? Biographical information about a writer is often interesting and can be enlightening, especially when taken within the context of an extended study. Yet we should never assume the availability of such information, or even the desirability of knowing it. The only prerequisite for understanding a text should be what we have directly in front of us: the text itself. Returning to McEwan and his diatribe against long novels, then, I can only add that this particular brick of an object massively outstays its welcome. That The Book of Strange New Things is a novel of huge ambition is not in doubt. For me at least, it falls tragically short in the execution of that ambition. Whether the book is an honourable failure, or so massively wrongheaded that it beggars belief, I cannot bring myself to decide. I don't like disliking books, especially books by writers I admire. I am glad that many people have enjoyed it, and found wonder in it. I hope my failure to do the same is a genuine case of it's not Faber, it's me. Nina Allan’s stories have appeared in Best Horror of the Year #2 , Year's Best SF #28 , and The Year's Best Science Fiction and Fantasy 2012 . Her story cycle The Silver Wind was published by Eibonvale Press in 2011, and her most recent book, Stardust , is available from PS Publishing. Nina's website is at www.ninaallan.co.uk. She lives and works in Hastings, East Sussex. This was spot on. Thank you!